Some people may find it difficult to distinguish the features of an ordinary bike and an electric bike. There are people who pedal electric bike to reach a place as the motor bike can carry them along effortlessly. Many still doubt why some of them look like bikes while some have the appearance of scooters. The confusion in appearance occurs mainly because of the designing of the e-bikes in two categories. Some of them have the looks of traditional bikes, with an attached motor on the frame. There are electric bikes looking like scooters. Hence it is not always easy to distinguish an electric bicycle and a scooter from external looks. An e-bike is never called a scooter or a moped. An electric bike can be styled and designed in any way you would like to look it. It can be given the look of a scooter. According to the stipulations of law, it should not have the specifications of a scooter. The speed limit of an electric bike in most countries is restricted to 15 mph only. Hence such a bike needs a motor that would not drive it faster than the stipulated speed limit. It is quite likely that your e-bike may go faster than this speed limit even without operating the motor or pedaling, while you descend a hilly route. An electric scooter is designed to take a speed of 30 mph and classified as a moped scooter. In most of the countries the law requires a normal driving license to ride the moped scooters without a motor cycle test. But you need to undergo a driving test to ride any type of vehicle higher than this speed. For riding an electric bike you need not undergo any test although some restrictions prevail in some of the countries. In the United Kingdom, any person aged below 14 should not ride an electric bike on the roads. Primarily there is no need to undergo a driving test. There is no need to register such vehicles with the authorities. There is no need of paying tax and registration fee. Similarly there is no need of taking an insurance coverage or wearing a helmet. The people generally have an apprehension why the electric bike is fitted with pedals, even though the motor makes the vehicle to run. 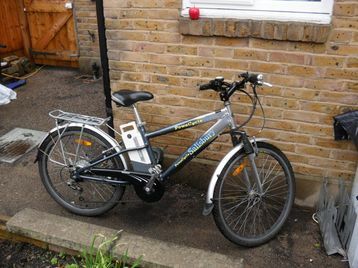 But there are modern electric bikes such as Salisbury LPX, which is feasible of performing three types of operations like normal cycling using the pedal. The motor also operates simultaneously and makes the peddling easier and softer, thus freeing the rider from fatigue. In motor- only types, you can ride twisting the grips leaving the motor to take the burden. Hence this class of bike is very useful and dependable. You can pedal an electric bike normally in plain grounds. You can pedal-assist while the motor is used for climbs when the cyclist even feels that he is pedal driving. You can ride in a total rest with the motor thus making the electric bike a slower type of scooter. With more and more advancements in battery technology, the electric bikes are becoming more popular. They are more environment-friendly than a motor car.